Each boy is valued as an individual and our primary aim is that he is happy and fulfilled during his time with us. Sophie Barber, the Headmaster’s Wife, oversees the pastoral care and works closely with the Headmaster, Houseparents, Matrons and Division masters/mistresses who all take the time to get to know each boy and identify their individual strengths, needs or concerns. Additional evening matrons and duty staff assist with the evening duties to ensure that there is always someone to talk to. Excellent pastoral provision is the responsibility of all staff and is a partnership between school and parents. Communication is key and the Division Masters/Mistresses meet with their boys each morning, and can be spoken to by parents when dropping off after exeats or contacted directly by email. A daily staff meeting is held first thing each morning to discuss diary matters and any issues concerning the boys, thereby ensuring a pan-school approach to promoting the welfare and happiness of every boy. We get to know the boys extremely well and there is an excellent rapport between staff and boys and the caring and homely atmosphere at Ludgrove enables each boy to feel secure, relaxed and happy. As a full boarding school, it is vital that boys feel happy, secure and relaxed upstairs. Our Houseparents, Mr and Mrs Pinchin-Hughes are at the heart of Ludgrove life, and they are responsible for maintaining a happy and calm routine upstairs. Living onsite, they oversee the nightly duty staff and invite year groups to their home for films and hot chocolate. Additionally, our wonderful team of resident matrons takes care of all the boys’ needs upstairs, whether it is helping with baths and showers and the bedtime routine, a clean set of clothes, a lost teddy bear or simply reading a story. The boys sleep in bright and spacious dormitories, in a mix of single and bunk beds and are encouraged to add a personal touch with posters, photographs and an abundance of teddy bears! Each term, the dormitories change and the boys are able to request friends they would like to be with. Board and card games are encouraged in the evenings before a period of quiet reading and every fortnight there is a prize for the best dorm. There is also an outing at the end of term for the overall winning dorm – a much coveted prize. Every Sunday the boys much enjoy the “Pinchin’ Mix”, a sweet shop with a wonderful selection of penny sweets run by Mr and Mrs Pinchin-Hughes. At Ludgrove we are firm believers in the benefits of the boarding experience and by living together in a close community, the boys are able to build up their self-confidence, community spirit and appreciation of others. They learn to develop a strong set of values, good manners and a balanced outlook on life. 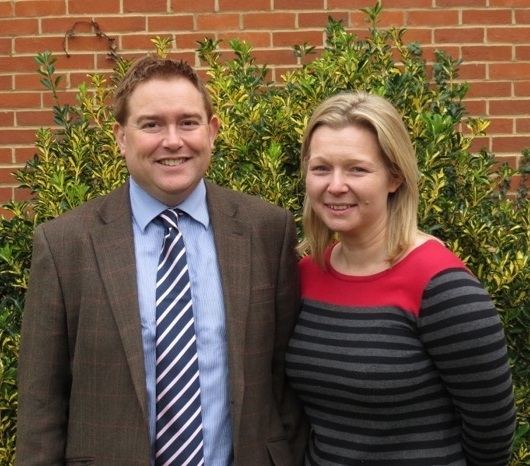 Jon and Tory Pinchin-Hughes joined Ludgrove in 2010 having previously been Houseparents at Belhaven Hill School and having taught at Beaudesert Park. Jon teaches Latin and English, and Tory, Geography and English and together they have a wealth of experience in caring for young children.